Over the years, Malayali’s shopping habits have changed. It has been a transformation from the neighbourhood mom and pop stores to the stylish shopping arcades and grand retail outlets offering a broad spectrum of merchandise. Malls have set a new trend in the way of shopping, where purchase, entertainment and eating out perfectly blended with each other. The opportunities have grown multi-fold, both for the consumer looking for a shopping paradise and the mall managers waiting to expand the product range on the selling platter. The options once again have skyrocketed with the plastic money enabling online transactions. There is a huge rise in the e-transactions with people being able to select from the immense variety on offer on the net. The network of eateries taking orders online and serving food hot into the home are ever on the increase. Consumerism in itself is not an evil thing. It is good for the economy. Consumption is at the centre of commercial activity and it should be promoted. If there is a floral decoration worth Rs.3 lakh for a wedding stage, it is a good thing for the floral industry. When we talk of retail, there is a lot of innovation. Innovation means practical applicability of anything -- new production, new methodology of marketing, packing and a whole lot of innovative practices. As for artificial intelligence, it has been making a considerable impact. If we click on some links that come in our e-mail, we may get scores of mails aimed at providing information on a variety of products the very next day. This is the kind of artificial intelligence prevailing in various sectors including retail. The consumer trends have changed. Today, a consumer is tempted to buy a product because it is not possessed by anybody else. Earlier, a consumer used to buy a product because it was owned by others, such as neighbours. Various marketing techniques including unique offers are flooding the market. The level of satisfaction of the consumer is important. Credibility of the product is of prime concern. If the quality is good, price is not a limiting factor. In fact, the price is determined on the basis of consumer preferences. The distinction between luxury and need has become narrower. Yesterday’s luxury is today’s necessity. Consumer education is the need of the hour. The consumer should be able to know whether a product sold under the ‘organic’ tag is real. Everything is market-friendly and consumer- friendly, but profit is the ultimate aim of business. Each person should be able to choose what he needs. It is, of course, a personal decision whether a product is for his need or comfort. Mall culture is good, but consumer’s interests have to be protected. Business is a game. Rationality and ethics are important in doing business. In the absence of ethics, the profits will be wiped out. The advantage of online purchase is that the entrepreneurs don’t incur expenses such as rent for showrooms, salary to employees at sales outlets and power charges. So, they can reduce the prices by 25 per cent or more. This is not possible in the case of offline stores. Customers could be broadly categorised into two groups --one which believes in the brand while the other makes purchase decisions on the ‘touch and feel’ basis. Every strategy is derived out of customer centric sense. Earlier, in nineties, customer had no choice. Whatever was offered in the market was bought by the customer. Now, with the help of technology, you can identify what is available and how to choose from. Personalisation or specialisation has come in a big way in the consumer market. We can customise many products based on our requirement. For instance, we can buy a customised shirt, say with particular specifications on the size of the collar, a modified version of the one displayed in the shop. Talking of artificial intelligence, there had been intelligent response from the shop-owners earlier too, but not on a scalable way. For instance, the tea-shop owner had identified the customers and used to supply customised tea based on the preferences of the customer. But scaling up in marketing can be done only with the help of technology. That is what AI offers. The retailer has to adopt a trial and error method to ensure optimum levels of satisfaction for the customer. Now there is a problem of plenty as far as money circulation is concerned. There are mostly two or more earning members in each family. With the kind of personalisation happening in the marketplace, it will be difficult for the small kirana shops to fight for their space, in the absence of modern tools of technology. Some of the small sectors are bound to be grossly affected in this race. Under the new scenario, newer employment opportunities will emerge. A lot of students have taken up job offers for supply of food using Apps. Over 30 practices that people used to do for various purposes have been taken over by the mobile phone. More are on the anvil. Future is going to be different. Under these circumstances, academic curriculum has to be tuned to the needs of the future. Whatever is being taught in schools and colleges now would become irrelevant if the curriculum is not updated to meet the future requirements. Several big business houses entered the retail sector in 2007-08. Everyone thought a retail revolution was going to happen in India. People were under the impression that organised retail was going to bulldoze the unorganised retail sector. The ‘kirana’ shops were expected to be closed down eventually. But within two years, when the honeymoon period was over, several big retail outlets were being closed down. An organised retail group based in Kerala had to make an exit in 2010 after failing in their bid to imitate the big players. On a study of the organised retail in Kerala, the purchasing habits of people came to the fore. The customers used to spend heavily at the modern retail outlets during the first half of the month, but during the latter half of the month, many of them returned to the neighbourhood shops where credit was available. In e-retail, what we see is the peripheral. If you don’t know the customer, surely you will fail. New technology is embracing the retail and the customer is getting a new experience. But on a close observation, it is clear that several items which were thought to have had gone obsolete have reappeared in a new avatar. Such items include bicycle, wrist watch and SLR camera, with the difference that the new products are much more expensive ones, incorporating new technology. The future of retail would depend on how new technologies are utilised, based on consumer behaviour. The trend in market is dependent on the money availability. Behavioural sciences too play a vital role in the market economy. While online shopping is flourishing, quality remains the watchword. Quality depends on brand name. The thinking habits of younger generation have changed. Youngsters are keen on placing orders for online purchase and are not interested in going from one shop to another in search of products. Behavioural sciences too play a vital role in the market economy. Fast moving changes are witnessed in retail sector. The mental frame of people too has changed. Everybody wants something new. 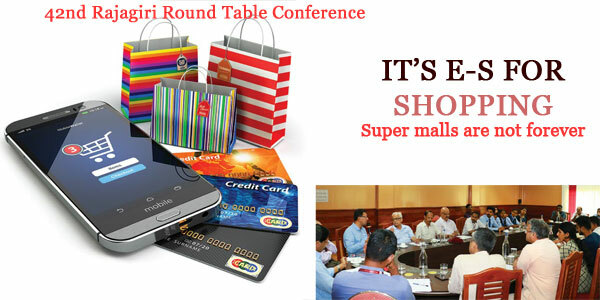 Discounts are being offered by e-tailers to attract youngsters. Brand names have become significant in modern commerce. Technology is bringing about a change in a number of sectors. Biotech, infotech and other fields of science and technology have been converging, resulting in new experiences. For instance, sensors are sought to be utilised to estimate the kind of insurance coverage one requires. The convenience of getting products at home through an electronic order, without going through the pains of road traffic, has led many to the online market. Innovations and new marketing tools have taken retail to new heights. Even while admitting that largescale production and mass consumption are good for the economy, one must pause and ponder over the question as to where the consumer revolution is taking us to. Ethics behind consumerism needs to be discussed. The question as to what benefit will mass consumption will bring to the society assumes relevance, amidst fears of another recession. Smart phones, utilised for a variety of purposes, are considered an electronic opium by certain thinkers. Consumers face the prospect of being cheated through marketing campaigns. The art of selling, in a way, depends on how cleverly can the consumer be cheated. Retail giants may be making losses initially, but they might be working behind a hidden agenda of pushing out all competitors eventually and monopolising the sector. One of the beneficiaries of the current developments in the retail sector could be manufacturing where a large number of jobs would be available. Two glaring trends have been witnessed in the US in the recent past. One of the retail giants, headquartered in Chicago, has perished while an e-tail leader, based in Seattle, flourished. It is the modern tale of two cities, where retail and e-tail had left footprints in diametrically opposite directions. The threat of large malls being closed down is not to be limited to US. It could be a reality in India too in the years to come. The death of super malls might happen in various Indian States including Kerala within the next 10-15 years. Convergence of technology on the mobile phone has made a big difference in the way people perform actions. In fact, the mobile phone could be called a multi-purpose mobile device. The choice of products available coupled with the ease of execution have made online purchases attractive. As the online transactions flourish, the youth could look towards more jobs in logistics and user experience (UX) segments. Tailor made products are back in the market thanks to innovative technology. A little more specialisation will happen in the retail sector. In several foreign countries such as Germany, there are specialised supermarkets. There is a likelihood of the trend reaching Indian markets. Ethical buying is the third important aspect in the current retail sector. People are aware of environmental issues and are ready to pay more for environment friendly products. In modern retailing, data plays a prominent role. When you search, order or purchase a product, you are feeding data to servers. The data analysis is used later for selling products to you. Internet of things would make it possible for the refrigerator to order things that you want to buy. In future, people will be consuming less, but luxurious things. It will be necessary to focus on the consumer needs for the retail to succeed in future. Apprehensions remain on the execution of orders in the case of online purchase. There have been instances of bad services. Internet of things is said to revolutionise the way we live. There will be more job opportunities in sectors such as logistics. But we need to encourage other areas of employment too. Data is going to be used in a big way in the retail sector. It will percolate into smaller sectors too. Students have a lot to learn from the current trends in retail. Everybody has more disposable income nowadays. The size of the e-commerce market is rising rapidly. Companies have to be competitive to survive in the present scenario. Market is flourishing because of the flow of money. But the online shopping activity is mainly urban-centric. There are remote rural areas in the country. I wonder whether the online shopping service providers would be ready to extend their offers to such places. The conventional shopping habits of Malayalees continue to thrive. More than 100 hypermarkets are coming up in various parts of the State. They don’t expect much threat from the e-market. Many of the shoppers browse online sites to make a study of the products, compare the price range and then go to the retail shop to make the purchase. A new virtual world order is being created, the US with software and China, with the hardware. The two countries have technological imperialism sans boundaries. The online service is not for masses, but is focused on individuals. For instance, even for an online cab service, there are different rates for individuals. The data that the online service providers get could be misused for other purposes. Technological revolution is making a big impact on the behavioural patterns of the youth. Environment related aspects arising out of the technology advances, such as harmful effects of radiation, are not getting due attention. It could affect the lives of people. Any development causing harm to environment won’t be sustainable in the long run. Unlimited choices offered in the retail sector often result in confusion among customers. Technology is a differentiator. Brands will have a shorter lifecycle. There is future for green products.